With Canada's largest capacity 30-inch French door refrigerator, LG has you covered. Combined with the Smart Cooling system, enabled by LG's exclusive linear compressor, your food will stay fresher, longer. You'll also enjoy the highly efficient and quiet operation that is 23% more energy efficient than a conventional compressor and is backed with a 10-year warranty. With all of this and more, this is a perfect addition to your home. You'll also love the convenient external water dispenser so much you may never want to buy bottled water again. This GE French door refrigerator features spill proof shelves for easy clean up. LED lighting positioned throughout the interior and under the fresh food doors illuminates foods inside the refrigerator and freezer. Counter-Depth design offers a built-in look by fitting nearly flush with surrounding cabinetry. 30-inch 22 cu. ft. French Door Refrigerator with Water and Ice Dispenser in Stainless Steel - ENERGY STAR® With Canada's largest capacity 30-inch French door refrigerator, LG has you covered. Combined with the Smart Cooling system, enabled by LG's exclusive linear compressor, your food will stay fresher, longer. You'll also enjoy the highly efficient and quiet operation that is 23% more energy efficient than a conventional compressor and is backed with a 10-year warranty. With all of this and more, this is a perfect addition to your home. You'll also love the convenient external water dispenser so much you may never want to buy bottled water again. 30-inch 22 cu. 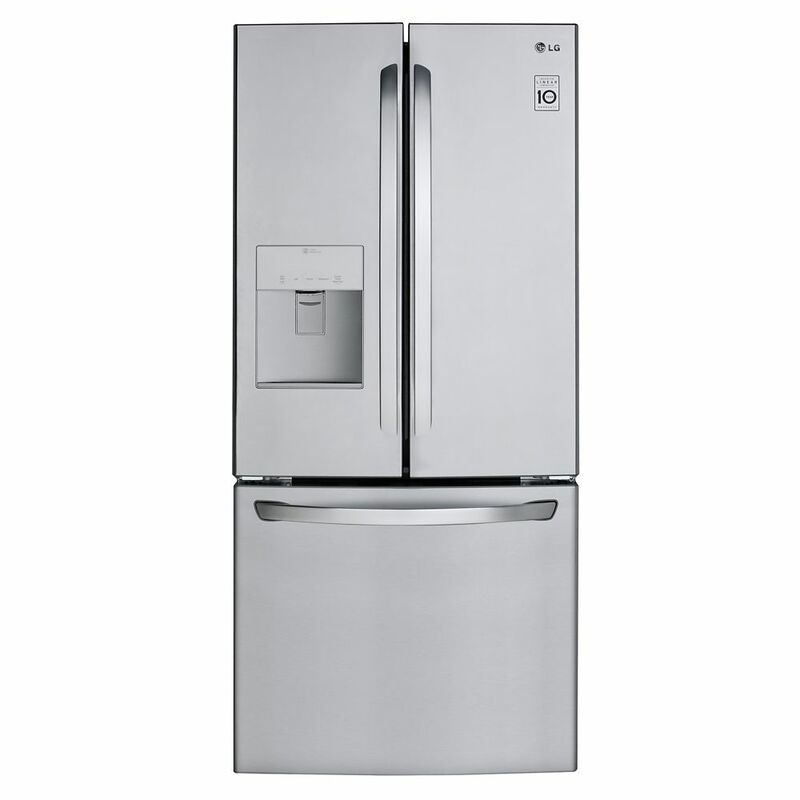 ft. French Door Refrigerator with Water and Ice Dispenser in Stainless Steel - ENERGY STAR® is rated 4.2 out of 5 by 53. Rated 4 out of 5 by Not Santa from Great Fridge for Us We bought this fridge a few month ago. When first plugged in it was noisy but the delivery guys took off the back and the cooling fins where hitting each other so he gentle moved them and the fridge has been great. The water on the door is nice and having the option not to use the filter is nice. I was not sure about having ice and water but I love it now. Rated 1 out of 5 by roywang from no cool water I just bought it just one day ago ,No cool water and ice . Rated 5 out of 5 by Jlee from Exactly what I needed Fits smaller space yet has all the features of a big fridge. Rated 1 out of 5 by Sman from Bad Practical Design in use The water filter cannot be bypassed to obtain water when the filter get a bit old, no water coming out or coming out very very weak. The inside drawer cannot be slide out unless both doors are opened, making it very inconvenience. The glass has too many gaps here and there that easily accumulate dirt visible and very difficult to clean them without taking all parts apart. The design outlook is good, but LG did not account for the practical use and ease of cleaning. Does this refrigerator make it's own ice? Have an ice maker in the freezer? Hi mackard, thanks for your interest in our product. This fridge measures 68.5 inches and has a width of 29.75 inches once out of the box and assembled. Two years ago someone posted in his review that the water dispenser gave out &quot;coldish&quot; water,not cold not lukewarm. Has this been resolved since, so one gets COLD water &nbsp;or/and is there &nbsp;a setting for this? No it's still &quot;coldish&quot;. Bought one 1 week ago. I don't see anywhere on the web where I can find out if the exterior water dispenser gives you cold water or lukewarm water like my current one does. If anyone knows I would appreciate the info. It's not lukewarm, it's cold but not &quot;COLD&quot;. I've had an old kitchenaid that would stream out COLD water and humidify the glass in the process. This one seems to be whatever setting the cold water from your tap is, which is just....okay cold. Had it for 1 week, so nto sure if there is a setting either like reran said. Does it come in white. Yes, it does. No external ice dispenser though. But there is a basket that takes up 1/3 of the top shelf in the freezer area. It collects cubed ice. However, you can switch off the ice dispenser and use the entire top shelf of the freezer for your frozen items. This fridge uses the slim ice and water dispensing system and that means it does not take up space inside for the machinery and it is hardly noticeable that the function even exists. Hope that helps.